Yesterday had been a really great day because the weather had been nice and sunny and the early part of the day had been relatively ea﻿sy and relaxed. I'd turned in quite early and fallen asleep really easily. When I woke up it was 04:40 which meant it was probably the longest I had slept since starting the pilgrimage. The only other place I had slept as ﻿well, was at Rainbow Hokusei. I switched on the TV and started updating my notes from the past few weeks. Today would be the end of the third week and I had now completed 38 of the 88 temples and in terms of distance I didn't really know how much I had walked but a considerable amount of distance had also been covered. The plan today was just to head back to the Drive-in Suisha and camp there again. Before leaving the Youth Hostel I returned the room to the state I had found it in. The blankets, duvets and cushions all had their place particular place so I made sure everything was nicely folded and stacked away. This had been something I had been doing at every place I had stopped at and I thought maybe it was another way of showing appreciation for the use of services even when I had had to pay for them. No one was up when I left the Youth Hostel and having already given the lady in charge a photograph and my osamefuda, I simply left a thank you note at the reception when I left. The stay at the Youth Hostel had been really great. It had been really clean and it had provided me with everything I needed especially a quiet and comfortable place to sleep. It had been incredibly peaceful and the only real sound I had heard was someone praying at the Shrine next door since my room was literally facing the courtyard of the shrine. There had probably been wifi available but there had seemed to be nothing in particular I needed to do online. One of the positive things about doing ohenro was how little I had missed being online and seemingly how easy it had been to avoid using the internet. During my first pilgrimage I had been posting a single photo and short message to Facebook each day and every day so my friends could follow my progress but this time I'd decided it was not necessary to do that. In fact this time, only a few people knew I was even doing it. 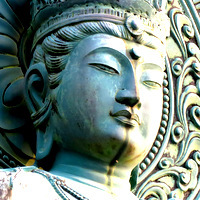 I wanted to visit Kongofukuji (#38 ) again so I headed the short distance back to the temple. I had already gone through my prayer rituals yesterday but I went through a simple pray routine at the main hall anyway. My main intention was to photograph the grounds a little more and the early morning seemed to show the temple of in a very different light. The large pond in the middle was mirror smooth and reflected everything really nicely. The large numbers of statues around the main hall also had a very different look about them in the early morning sunshine. The whole atmosphere was very nice. As I was walking around the lady who did my stamp yesterday greeted me and said I could stay in shukubo today and apologised for it not being available yesterday. I told her it was fine and apologised for not knowing it was closed yesterday. Then a young woman approached me and asked me where I was from which led to the usual type of discussion and before leaving I gave her and her friend a photograph each. Today there was no rush and like yesterday I had plenty of time to retrace the same route I had taken yesterday. The plan was to continue gently back to Kobutsu and see if I could get something to eat either in the shop I had visited yesterday or the restaurant I had eaten at during my first pilgrimage. I hadn't proceeded very far when progress was temporarily interrupted by a couple of women who were interviewing walking pilgrims about their experiences in Kochi and they seemed to be particularly interested in finding out about the trail and facilities between Iwamotoji (#37) and Kongofukuji (#38). The distance between the temples is quite long and they were keen to find out what walking pilgrims thought could be done to improve things. I had eaten one of my emergency dorayaki back at the Youth Hostel earlier in the morning but I was starting to feel hungry and my stomach was looking forward to getting to Kobutsu. As I approached the zenkonyado I had passed yesterday I spotted Mr Muri coming towads me and his first remark was “You're fast !” He was walking without his pack which probably meant he had left it at a minshuku and was planning to return after visiting the temple. We didn't chat long and were soon heading away from each other. I then met several other pilgrims who I had met already along the way. One was someone I had taken a ferry across with when going to Sekkeiji (#33), another was someone I had met with Inoue-san on the way to Onzanji (#18) and yet another was someone I met for the first time at Kakurinji (#20). There were also several others who I had not met before but it seemed like the whole walking ohenro community today was walking to Kongofukuji (#38). I also met a young cycling pilgrim who had stopped to ask where I was from and then continued on towards Kongofuku (#38). It didn't take long before I arrived back at Kobutsu and I headed first towards the shop but seeing that the restaurant was open I went into the restaurant. I was expecting to be greeted by one of the three older women I had met last time but instead I was welcomed by a very friendly younger woman. I asked her what was on the menu and she told me it was either a toast set or an onigiri set. I opted for the onigiri set and waited. When it my food arrived it looked very tasty. I has 3 small rice balls, some kind of side dish, a simple salad, miso soup with mussels and half an orange. All this came with my drink of choice which for this pilgrimage was definitely hot coffee. I took my time enjoying my food and after finishing I prepared a photograph and my wrote out an osamefuda. On the way out I paid for my breakfast and gave the woman the photograph and osamefuda.I told her I had stopped by the restaurant during my first pilgrimage and that the 3 ladies whose photographs were on the walls of the restaurant had been very kind to me. She seemed please with the photograph and osamefuda and told me to come again for a third time. I felt re-energized again after my pit stop for food and continued on along the coast road and then turned away and continued through the wooded area. I decided to stay off the wooded trails and stuck to the narrow twisting lane. I greeted and was greeted by several people along the way and by the time I exited the wooded lane the sun was out and it had turned into a lovely sunny day. 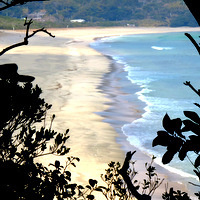 I left the small community of homes and was soon back on the main road heading for Ohki Beach. Another pilgrim overtook me and I noticed him follow some trail markers down onto Ohki Beach. I followed him down and found myself walking along the beach. Yesterday I had just stuck to the main road but it was a nice change to be on the beach with waves breaking gently not so far away. I had not really planned to be on the beach because my real plan was to have some lunch at Ohki Cafe before returning to Drive-in Suisha. With the convenience store out of action the cafe was my last hope. I did have snacks with me but I figured proper food would serve me better. If I walked all the way across the beach I would come off near to Kaiyu which would mean missing the cafe so when I came across a surfer taking a break from the water, I asked him how to get back to the main road. He told me to go to the beach hut and just follow the path to the main road. There was only one beach hut along the whole stretch and following his directions I re-joined the main road again. As I neared the cafe the young cycling pilgrim who I had met a little earlier cycled up to me. He seemed surprised I had walked so far since we had last met. I asked if he had eaten anything, wondering if he wanted to join me for something in the cafe. He said he had so I asked him where he was going to be staying and he said he didn't know yet but would decide after he had visited Enkoji (#39). I suggested he could stay for free at Enkoji (#39) and he seemed surprised that this was possible. I let him photograph a list of temples that provided tsuyado lodging and also let him photograph the list that Hagimori-san had given me. I told him specifically about the zenkonyado after Goshoji (#78) and Ichinomiyaji (#83). I also gave him a photograph and told him he could check the lodging list I had on my website. He thanked me for the information and we said our goodbyes. For lunch I ordered Japanese style fried chicken which came with rice and miso soup. It arrived fairly quickly and looked tasty and substantial. I ate everything and after finishing continued merrily on my way. I was then soon at Kaiyu and I thought I would check to see if I could pick up the free wifi and leave a photograph behind. While I was doing this I spotted a couple of overseas visitors who said they were looking for the owner. They had apparently called owner and he had told them that he would fire up the wood burning onsen for them. I could smell wood burning so I told them to wait for the owner to show up. I had not expected to see the owner because I had thought he was away on holiday but I recognised him as soon as he showed up. While he chatted to me the two visitors who he had been preparing to use the onsen decided to leave and headed on somewhere else. 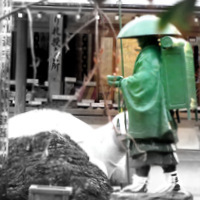 I explained that I had stopped to use the onsen twice during my first pilgrimage and was just passing by again to say thank you and to give him a photograph. He seemed happy that I had remembered. I asked what had happened to the wifi and he said it was switched off. He invited me in and switched it on, put on some music, served me so really great tasting tea and then disappeared again. I had not checked my email for several days and I found a message from Das telling me she had had a nightmare time trying to find a place to stay the day I had stayed at Tosa Kokumin Shukusha. Due to that experience she had stayed put for an extra day and now I was ahead of her again. Thankfully she was doing fine and was actually on her way to Kongofukuji (#38) which she hoped to reach tomorrow. I thanked the owner of Kaiyu for the use of the wifi and the great tasting tea. I told him I would add this small encounter to my new ohenro website when I got back. With that I was back on my way to Drive-in Suisha again. As I pottered along I was thinking about the SMS message Das had sent a short while earlier. She had mentioned having dinner with the Beno and Susanne and had invited me to join them. I was on my way to Drive-in Suisha so I couldn't imagine dinner was going to be anywhere between Kaiyu and there and just as I was thinking this I spotted Beno and Susanne walking towards me. It was great to see them because I had also found an email from Susanne asking me to join them for dinner back when I was at Tosa Kokumin Shukusha and on that occasion they were still a little way behind me. ​It was actually really good to see them both. Both looked in great spirits and both looked like they had caught a bit of sun. Their plan was to rendezvous with Das on the opposite side of the cape peninsula and stay at a business hotel. Beno was already hungry and dinner was not planned until later in the evening so I suggested they visit the cafe I had been too and suggested that maybe we could catch up in Matsuyama where I planned to spend a couple of days. With that we said our goodbyes and continued on our way. I had been seeing a steady stream of pilgrims coming in my direction all headed to Kongofukuji (#38) and next to arrive was another overseas pilgrim who turned out to be Olaf from Germany. I mentioned that I had just been speaking to a German couple not 10 minutes ago. It was almost 4 o'clock and he had no concrete plans about where to stay and not wanting to delay him I excused myself and let him continue on his way but suggested he could switch routes and join the Beno, Susanne and Das at the business hotel they were booked to stay in. A short while later I saw another pilgrim coming towards and he was positively beaming. He had some music playing on a small speaker and he could best be described as a heavily sun tanned walking smile. He had his camera at the ready even before I got near him and the first thing he asked me was if he could take a photograph of the two of us. Next he went to get something out of his ohenro bag which I assumed would be his osamefuda but it turned out be his osamefuda and 1000 yen as osettai. It just didn't seem warranted and despite my protests I accepted it and gave him a photograph which I was also readying for him. I then continued on my way again. I had not gone too much further when I spotted another pilgrim coming towards me. He was still a little too far away for me to figure out who it was and it was only when we got close enough that we both realized who the other person was. It was Nobuhisa and he was walking comfortably and without any of the discomfort he had been showing the previous times I had met him. The strange thing was that I had been thinking about him and wondering how he was doing. He had been suffering terribly because of blistered feet and I had sometimes wondered how he was coping. The person I saw now was someone who looked leaner, fitter and altogether happier. All I could really say to him was that I was really pleased to see him and all he could say in reply was that he was really pleased to see me. Since getting rid of his hiking boots and replacing them with softer running type shoes he said he had been much happier. I was really happy to see that he was looking fit and well and walking without any discomfort. I shared some candy with him and for that he tried to give me a large energy bar which I felt I couldn't accept so he gave me a smaller muesli bar instead. With that we said our goodbyes and continued in opposite directions. After Nobushisa I met and greeted a line of about 10 or 12 pilgrims coming my way. It really had been a great walk back towards Drive-in Suisha and the best thing about it was that I had encountered so many people including people I knew. Just before I got to Drive-in Suisha I found a couple of caged rabbits who seemed as happy to see me as any of the pilgrims I had met on my way back. I think the rabbits were actually waiting for their owner to turn up and feed them because when I stopped to say hello to them they seemed to get very excited. Their leafy looking food was just out of reach for them so I gave them a few leaves of what looked like spinach and then continued all the way to Drive-in Suisha﻿. When I arrived back at Drive-in Suisha there was no one there so the first thing I did was put up my tent and sort out my sleeping mat and sleeping bag. When I had settled myself in and starting thinking about the past two days I felt they had been two really great days. In fact the past several days had all been really great. There had been non of the physical hardships that I had experienced during my first pilgrimage. The weather had been perfect and the encounters along the way had all been really wonderful. I seemed to be doing just what I had said I would do if I ever did the pilgrimage again, and one of those things was, talk to more people but spend more time alone. For the past week I had been largely on my own but I had spoken to many many people. Being alone helped me feel like I was fully immersed in the pilgrimage and meeting others helped to reaffirm that it really was a shared journey.